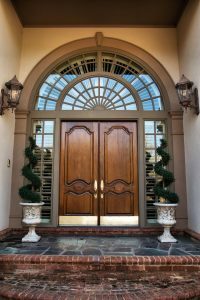 Building a new house is always exciting, and if you’re including unique architectural features such as archways or alcoves, it’s important to make sure they’re properly illuminated. This is especially true on the exterior of your home where passers-by can see the distinct design features that make your home stand out among the others in your neighborhood. At Hortons Home Lighting in La Grange, we have a fantastic selection of architectural lighting options and can help you choose the best fixtures for your new home. While many houses today include straight lines and perpendicular corners, some homeowners still opt for curves and arches. An archway leading into your dining room can add a touch of class, and curved alcoves on the outside of your home can break up the straight lines of your roof and front entryway. For the interior of your home, wall sconces on either side of the arch can illuminate the curve and accent any decorative moulding or design. For the exterior, consider adding landscape lighting that is focused upwards and defines the outline of the arch or alcove. The contrast of light and shadow will create the dramatic effect you want, and can be a great addition if you have curved windows. Another popular architectural feature found in many homes is a vaulted ceiling. Owners may want their living room ceiling to stretch to the second floor, or they may have an entertainment area at the back of the house that they want to feel open and inviting. If the floor plan includes vaulted ceilings, lighting those ceilings should be a top priority. The main ceiling fixture can be a large chandelier or other type of hanging fixture, but that will only provide the ambient lighting for the room. Upward-focused accent fixtures along the sides of the room will direct light towards the top of the room, showcasing how expansive the space really is. If the room is particularly large, consider adding multiple hanging fixtures and perhaps even track and rail lighting. If your home’s design will include a lot of windows and other glass surfaces, be sure to think about how the light will interact with those features. Interior and exterior light will shine through and reflect off these surfaces, and you’ll want to ensure there isn’t too much glare. You’ll also want to think about privacy and security, and how your light fixtures will help or hinder those aspects, especially in areas with multiple windows. Our design experts can help you find the ideal options for your home, and explain the advantages and disadvantages of each fixture. If you’re building a home in the Chicagoland area, and you’re including unique architectural features such as arches, vaulted ceilings, and more, come to Hortons today to find the optimal lighting solutions. We know how to approach each design situation and will assist you however we can. Before you know it, your home will be finished!